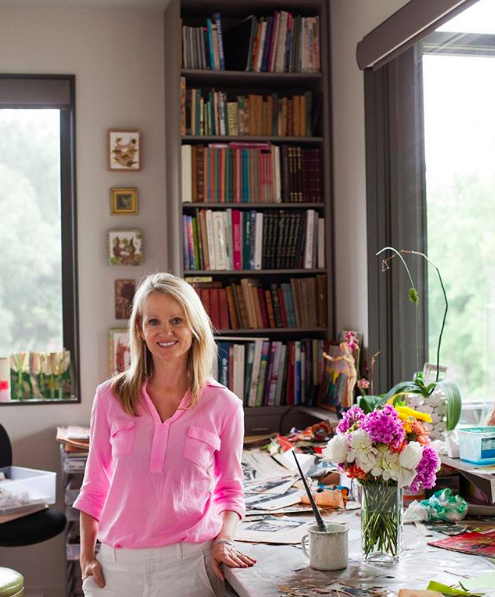 Her Dallas studio is chockfull with boxes of found and collected objects from literally everywhere. She has rescued trash out of a muddy puddle, and countless objects on long walks with her husband and dogs. In fact, she was almost arrested in front of the Supreme Court building in Washington DC when a piece of peeling paint on a public trash can caught her eye. A scary swarm of armed security officers quickly surrounded her on bicycles, demanding she hand over the chunk of paint. And Brenda's favorite haunt is in Paris where she finds hand lettered antique documents and paper ephemera. She defines collaging as painting with paper and coaxes this chaotic medium into an intriguing work of art using her distinct style of color, pattern, and texture. Brenda holds a degree in Interior Design from TCU and has studied painting and drawing at SMU extensively under Mary Vernon and Barnaby Fitzgerald. Brenda is a native Texan and she lives in Dallas, Texas with her husband Bill and has two adult children.